Are you sick of seeing This Device can perform faster balloon message pop up every time you are using an older flash drive or other device? Here we’ll show you what to do to get rid of it once and for all. You know the message…it pops up when you put in an older USB drive and tells you it can perform faster. 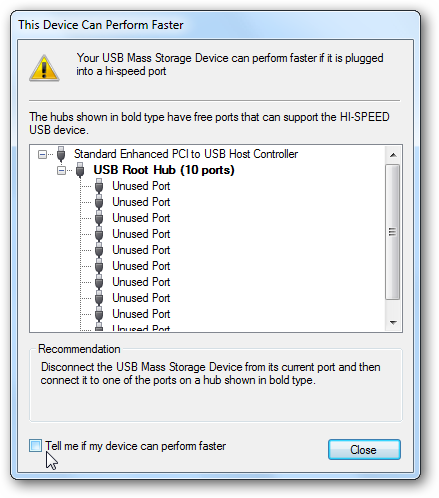 Click on the balloon message to see a list of available USB 2.0 ports. At the bottom of the This Device Can Perform Faster window, uncheck the box Tell me if my device can perform faster then close the window. That is all there is to it. Now you won’t be annoyed by that message when you’re using an older flash drive or other device.